New work! Re-purposed some advertisements, bottle caps and extra material I had lying around. Even more new work! Took an old slide of earth and turned it into a pendant with gold glitter. The other is a loch ness monster I found from a random ad in the mail turned into a brooch. Haven't been making new pieces as much and have been focused other aspects of Rock Resurrection Art Guitar Pick Jewelry. 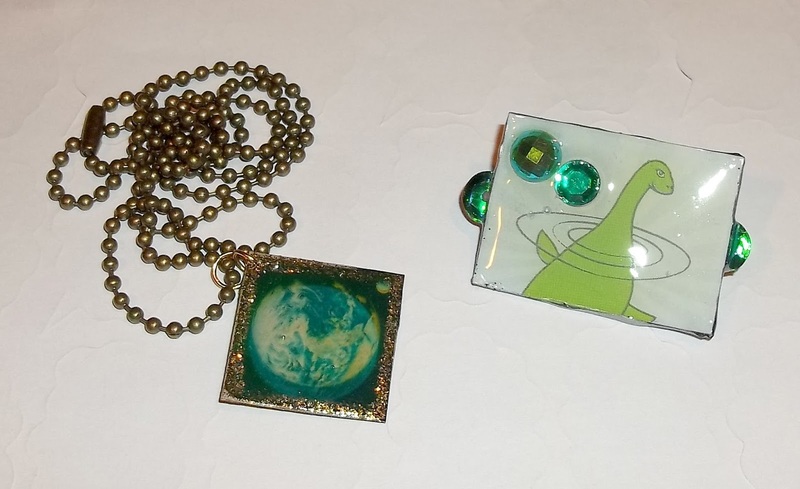 But I did recently make these pieces with some random bits I have. The lego looking ones are rubber and I really liked the material. The other one is a gem-covered 45 record adapter brooch.